The increasing use of the internet has had both positive and negative effects for photographers. On one hand it has given photographers access to unprecedented levels of free or very cheap storage, which has become a necessity for dedicated digital users. Similarly, image search applications have meant that it is now easier than ever to get your photos seen. On the other hand, however, this has also meant that the photography has been devalued. As a result of this, and of the ease of public access to photographs, copyright abuse has increased at an alarming rate. As a photographer, therefore, it is useful to understand the basic characteristics of copyright law. In most cases, the copyright in an image is automatically the property of the photographer. This legal standard remains the same regardless of whether or not the copyright has been registered; under British law, copyright is conferred at the point of creation, meaning it is owned by the photographer by default. There are, however, a number of exceptions to this. Primarily, it should be remembered that any image taken by a photographer who is employed by an organisation for that purpose becomes the property of the employer rather than the photographer. If, for example, a wedding photography company employs a photographer to shoot an event, the copyright in the images taken for that purpose will be the property of the company rather than the photographer. If, on the other hand, a freelance photographer is paid by an individual to take photos of a wedding, the copyright will remain with the photographer in question and not the individual. In most cases such as these, the arrangement between the individual and the photographer will include a single print of each image. 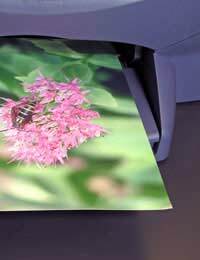 If the individual requires extra prints, they will have to negotiate a subsequent rate as the photographer is still the copyright owner. Although there is no legal necessity to register your copyright, you may find it beneficial to do so. This will help to eliminate the possibility of another person claiming ownership of your images. The process is very easy, particularly as it is now possible to register copyright for images online. This can be done through the UK Copyright Service website. It is often best to compress a number of images into a single file, using the 'zip' format, in order to save time. Regardless of whether or not you register your images, it is always advisable to mark your copyright digitally. This ensures that potential licensees are aware that copyright exists on the images. This can be performed in a number of different ways. Often, photographers choose to digitally 'watermark' their images. This entails placing semi-transparent text across the image which contains the contact details of the photographer. This serves a dual purpose, in that it generally renders the watermarked version unusable, thus eliminating the possibility of unauthorised use. Another alternative, however, is to use EXIF data. This is textual data that is digitally embedded in the file. Most image editing software has an EXIF editor, which allows you to edit fields that follow copyright guidelines. You will be able, for example, to add an 'image title' field, as well as data specifying the name and contact address of the photographer. If you find that an image for which you own the copyright has been used without your permission, you first step should be to contact the individual or organisation in question to inform them of this. If you feel that you should be compensated for the use, you may find it useful to check the National Union of Journalists website to determine the standard industry rate for the type of use in question. What is a Single Lens Reflex?